A week ago Google announced the release of a safe browsing diagnostic tool. To use the tool, just append a URL to the end of http://www.google.com/safebrowsing/diagnostic?site=. For example, to test this site, you would enter http://www.google.com/safebrowsing/diagnostic?site=https://searchengineland.com/. Google will then return four sets of security information about that page. (1) The current listing status of a site and also information on how often a site or parts of it were listed in the past. (2) The last time Google analyzed the page, when it was last malicious, what kind of malware Google encountered and so fourth. (3) Did the site facilitated the distribution of malicious software in the past? (4) Also, has the site has hosted malicious software in the past? Google has shown an example of a site that has malicious results. To see such results, go over here, it is safe to click the link. If you do not want to click the link, I have provided a full screen capture below. The Zero Day blog has some additional information on this Google security release. NOTE: If you saw a malware warning on Jan. 31, 2009, this was due to an error that briefly impacted all web sites. 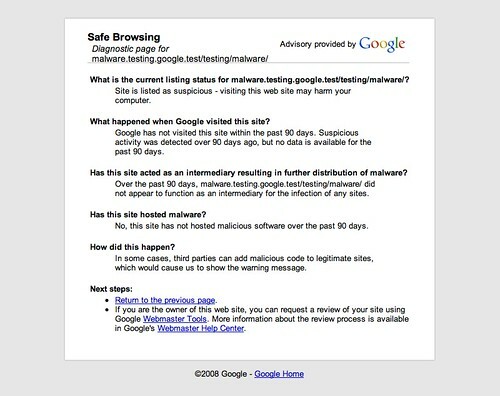 See Google Gets Fearful, Flags Entire Internet As Malware Briefly, for more.